Inject freshness and vibrancy into oil paintings with Haidee-Jo's style that demystifies the media to create contemporary work. Subjects include portraits, landscapes, still life and more. The book is aimed at any level from beginners to those looking for new techniques. Fine everything you need to know including alla prima, colour and painting figures. 4 very good step-by-step projects are included - cafe scene, a female portrait, the boats seen on the front cover and a garden. The contents are divided into introduction, materials, inspiration, oils, drawing, alla prima, composition, values, colour, plein air, sketching, figures plus the projects and greys, lost and found (edges), your voice and the index. The book is highly instructional with excellent text - every word counts. Much of the painting is like cameos and the book is full of examples of her painting. I love the snow scene of the allotment, it is so fresh with excellent light. However, I personally find her work rather sketch-like and prefer my oils a bit more traditional. An interesting book none the less that I believe will deservedly have wide appeal. Of all the oil paintings books I have read, I think this is very useful. Award-winning artist. 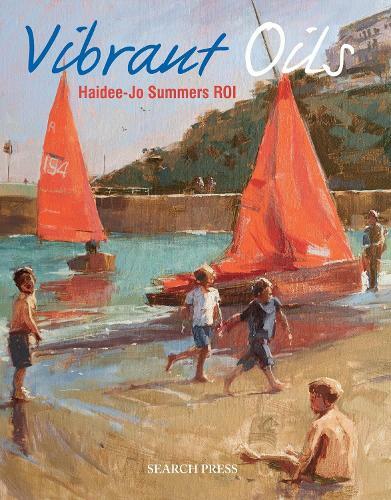 Haidee-Jo Summers has written her first book -Vibrant Oils- for Search Press and vibrant it certainly is! Haidee-Jo's work is filled with light and colour and her application of oil paint is sumptuous. The medium is brought up to date in her hands, resulting in luminous oil paintings that look as though the paint is still wet to the touch. As well as the inspirationthere is plenty of technical advice. Four step-by-step projects will help you to work alongside the artist to achieve your goals. This is really rather wonderful. The initial impression, picking it up, is that it's more than usually substantial and, at 176 pages, it most certainly is. A quick flick through reveals a wealth of illustrations and an enormous variety of subjects. Haidee-Jo's style is loose, relaxed and colourful and this doesn't, on the surface, feel like an oil painting book, insofar as those are often rather lofty and worthy. The truth is that it's not really a medium book at all, but rather a guide to the whole creative process that just happens to use oils as its vehicle. I'd even go so far as to suggest that you could find plenty to get from it even if you never had any intention of working in the medium at all. This is amazing. Books on oil painting are a rare thing, but this is a whole lot more than that. You could, in fact, ignore the medium completely and treat it as a guide to the practice and philosophy of being an artist. For a start, it's not insubstantial, although the paperback format tends to disguise that. It is also filled with illstrations that cover just about every subject you might want to tackle. Badly-handled, this could lead to superficiality, but there are examples, demonstrations, hints, tips and breakout panels that keep you interested throughout. Haidee-Jo's style will be familiar to The Artist readers - it has a vibrancy that enthuses itself and contradicts the often worthy reputation of oil painting. This is a book to revel in. Open it and you will be lost for a considerable time. Although comprehensive, it's never verbose or confusing and is constantly delightful.